FREE Urban Escrima Self Defence Induction Session - Thursday 29th August! The next FREE Urban Escrima Self Defence Induction Session will take place on Thursday 29th August from 6.30 - 7.30pm at London Fields Fitness Studio. Places are limited so book now on info@urbanescrima.com. Below is a clip of what we are about. 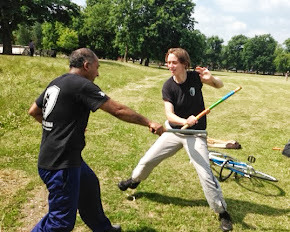 Self Defence London - Urban Escrima in Action! Here is our latest Self Defence video. Thank you to everyone who helped create the video and to those who took part, we are very grateful. If you would like to see further Urban Escrima Self Defence videos please check out Youtube chanel. If you would like to find further information on the self defence system we teach, please go to the www.escrimaconcepts.com or www.facebook.com/escrimaconcepts. Here is our latest video with an Urban Escrima practitioner, Chris. For more videos, please visit our Urban Escrima Self Defence website. The Self Defence Environmental Awareness Seminar was Explosive! If I learned one thing it was the importance of “Exploding”! The aim of the day was to give a taster of the higher grades of the Escrima Concepts Syllabus but also link the training all the students have been doing and ground it in realistic situations and different scenarios. We began the seminar like any other lesson as with movement drills, working on our off lining but working on another aspect of the system “explosion”. We started with a 4 for 4 drill where 4 attacks were fed by an attacker. After the 4th and final attack the defender “exploded” changing their energy and role in the scenario from being a passive defender to an aggressive attacker who would then feed 4 attacks of their own and vice versa. Although it was a simple excercise it was still challenging as a defender changing your energy (exploding) and redirect it back at your attacker in a split second. We practised “exploding” from different scenarios including enclosed spaces ,if your bag was snatched, walking with your mobile phone, fending off armed multiple attackers, from a seated position, attackers around corners and at different levels such as walking up and down stairs. In order for something to “explode” a trigger needs to be set off. The Instructors asked the class when should you react to an aggressor? The answer is “as soon as possible”. But only through developing an awareness of “zones” and identifying when a potential attacker enters your zone. It was a good day and an excellent turn out with lot of hard work shown by everyone. It re-affirmed to me how much more there is to learn in the system and that made me want to work harder. I’m also lucky to be learning and training with some dedicated and talented students and instructors.